James Cohan Gallery is pleased to present a new exhibition by American artist Erick Swenson, opening April 1st and running through May 1st, 2010. This is the artist's third exhibition at the gallery. The centerpiece is a new large-scale sculpture, Ne Plus Ultra (2010), on view with a selection of other works dating from 2001 to the present. 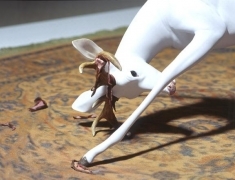 With striking verisimilitude, Swenson's uncanny dioramic sculptures, inspired by the artist's childhood passion for the taxidermy animals at the natural history museum, are populated by mythical animals; these hybrid creatures are strangely familiar and yet appear to come from an entirely different realm. On view in the main gallery is the recent work Ne Plus Ultra, an elaboration on Swenson's earlier sculpture of the same name; a depiction of a decomposing animal head with a scrimshaw-like engraving on the exposed parts of its scull. 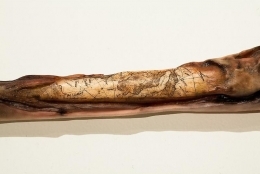 The work's title, which translates to "No Further Beyond," is a Latin term commonly used by early cartographers to delineate unexplored territories beyond the known world—indicating both a figurative and literal "Ends of the Earth." In this new sculpture of the animal's entire body, the decayed and receding flesh reveals scrimshaw carvings all over its skeleton. The designs of the scrimshaw resemble an old Mariner's map; a ship's manifest, a turbulent seascape, hints of a cartographer's legend, mapped coastlines. It would appear that the bones of this animal were carved from within, as if these markings convey the information and knowledge accumulated over its lifetime and these remnants of a living being contain an entire geography or universe unto itself. 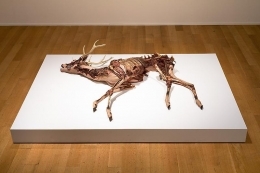 As the viewer confronts this gruesome depiction of the decaying animal body, the artist draws our attention to the existential truth that just as our physical selves will one day disappear, so will the intangible aspects of our identities, memories and personal histories dissolve away. 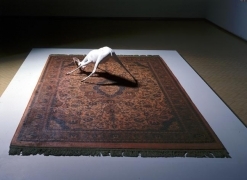 Also on view in the main gallery is Untitled (2001), a large-scale piece first shown in the Whitney Biennial in 2004, in which a young buck standing in the middle of a faux Persian rug is struggling and tearing away at the rug with his antlers. This bizarre scene sets off the contrast between this young animal's primal instincts to shed the velveteen covering from his maturing antlers with the well-ordered sophistication of the rug's intricate patterns. This work frames the tension between the wild and the tamed, the innate and the cultivated, while it highlights the perversity of culture's attempts to control natural instincts. 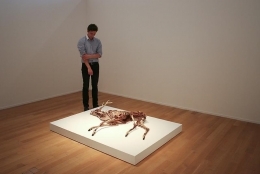 Swenson's work has received solo exhibitions at the Savannah College of Art and Design, Savannah and Atlanta, GA (2009/2010), James Cohan Gallery, NY (2007), The Hammer Museum at UCLA, Los Angeles, CA (2003), Museum Villa Stuck, Munich, Germany (2002) and was included in the 2004 Whitney Biennial. His work is found in the permanent collections of the Dallas Museum of Art, the Modern Art Museum of Fort Worth, the Saatchi Collection and the San Francisco Museum of Modern Art. Swenson exhibitionsly lives and works in Dallas, TX. For further information please contact Jane Cohan at jane@jamescohan.com or Peter Brandt pbrandt@jamescohan.com or by telephone 212-714-9500. Please visit the artist's page on the gallery website at James Cohan Gallery for more images, articles and biographical information.